Back in Mid-December, I created my first rankings of the freshmen in the Big Sky. With the season near the end, it's time to take another look at things (and we probably will at the end of the year too). As always, top five in the conference. Garrity continues to lead the conference in assists, he is sixth nationally, and highest among all freshmen in the country. He has come in and led the team from day one, and that is impressive to do. His assist rate is eleventh in the country, and he has logged a ton of minutes for the Hornets. 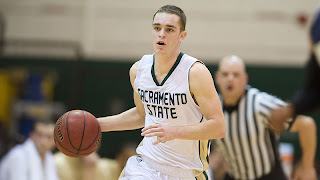 It is clear what he needs to do to get better - cut down on turnovers (three per game), improve his outside shot (31%), and bulk up a bit - but it is also clear that Sacramento State has a very nice leader for their offense. The last time I did this list he didn't even make the top five, which shows how much he has gotten better as the year has gone on. He is the Bears' go to player offensively, and usually has the ball in his hands if it is late in the game. He has been a very efficient scorer, as he shoots 80% from the stripe, 50% inside the arc, and 43% from downtown. Those are great numbers. He is going to be a great player for UNC by the time he is done there. He has had to shoulder a lot of the offensive load, as Gabe Rogers has not returned to be the offensive threat he was before he hurt his shoulder. Douglas has struggled at times and been more of a volume scorer, but has shown a lot of ability. He has good range on his jumper, and solid quickness off the dribble. He could be one of the leaders scorers in the conference as early as next year, depending on what type of system a new coach brings in. Kelly has come on of late and hit a lot of big shots, most notably against Northern Colorado and Northern Arizona. He is an excellent shooter, and at this point in his career that is about all he does. Still, for a walk-on freshman he has had an impressive season, and is a nice piece for a team that will lose a lot of talent this year. He is Jim Hayford's type of player - smart, doesn't make a lot of mistakes, and can knock down shots. Bewernick is an undersized forward in the mold of Chehales Tapscott of Portland State. He is a great rebounder for his size (and has very nice rebound percentages), scores efficiently down low (shooting nearly 60%), and can make some things happen defensively. Whoever the new coach of Northern Arizona is, the cupboard should not be bare, despite the poor record. They have some solid, young talent. Next year when these guys are all sophomores Dre Winston from Portland State who will be a redshirt sophomore next year will be head and shoulders above these guys. Remember that name. I've covered the Hornets all year, and one of the amazing things about Garrity is that he has actually put on weight during the season. It's not much, but it speaks to his off-court discipline. He'll come back much stronger next year. The biggest thing that needs to happen is he needs to shoot more when he drives. Many of his turnovers are a result of passing up easy shots. His attitude as a pass-first guy is great, but he can't be passing up easy shots. He would be terrifying if his long-range shooting improves too. I can only remember one shot that he's missed trying to beat the shot clock with a hand in his face from four feet beyond the arc. He's attempted at least four of those that I can remember.